"Worldwide supply chain manager of your aircraft spare parts"
Spare Parts Manager Spare Parts Manager is a powerful software package designed for the management of spare parts. Dedicated to the aerospace industry, it is intended for all companies dealing with listed items (part numbers) on a daily basis (spare parts, consumables, expendables, tools, chemical products, any part numbers, rotable components), particularly for brokers, stockist, repair shops, distributors and manufacturers. Expendable Consumable/Expendable means a part or material, which is routinely used and/or discarded during the course of removal, maintenance, repair, overhaul, testing and inspection services (i.e. nuts, bolts, rivets, sealants, etc). Gallon US Barrel, Liquid - U.S.
Incoterms International commercial terms are a series of international sales terms widely used throughout the world. They are used to divide transaction costs and responsibilities between buyer and seller and reflect state-of-the-art transportation practices (visit http://en.wikipedia.org/wiki/Incoterm for more information). Document completed at receipt of parts to check integrity of material (quantity, condition, certification documentation, …). In the event of a non conformity, a “Discrepancy Form” is completed. Store In SPM, this entity enable to stock spare parts. One or more store can be located in the same warehouse. SV Serviceable (see Condition). Airworthy spare accompanied by a green FAA 8130-3 and/or an EASA Form 1 and/or a TCCA24-0078 serviceable tag. "TAT" is expressed in working days, starts the day Unserviceable Component is received DDP at the Delivery Point and ends the day Serviceable Component is put at the disposal of the Customer, Ex-Works at the Delivery Point. TAT measures the average time required to perform the necessary in-house rework on a normal worn out unit having an up to date standard of modifications. A Technical Standard Order Authorization – TSOA from the Federal Aviation Administration authorizes a manufacturer to produce a material, part, or appliance to a TSO standard. Receiving a TSOA approves both design and production of the TSO part. 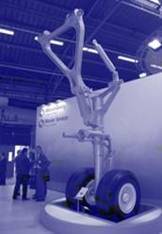 A TSOA does not authorize the installation of a TSO part in a certificated aircraft. The standard procedures for the installation or modification of an aircraft must be followed such as a STC, field approval, etc.